Contents: Peas, biscut, meat and gravy, rice, chocolate milk, and a peach. Hm, the only think I actually would want to eat here is the peach. And maybe the chocolate milk. 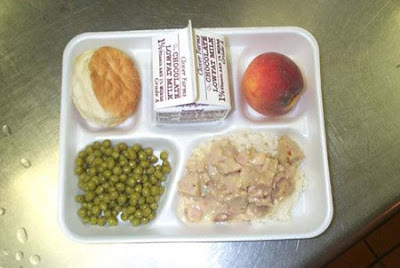 I see a lot of lunches on this site served on that same white styrofoam tray. Are they all from the same school? If so, what area of the US are they from? I have never seen anything but modular plastic trays at my schools. A sandwich and fries for lunch? It is not food for children! I actually like the chicken and gravy over rice food! (: i would like the recipe.